It has been a bumpy ride, this run-up to Christmas. My children are excited to be on holiday and the house is filled with light and festive paraphernalia, but outside our cosy bubble there are so many tragic events blighting the world. Guilt is my primary emotion. How have I, and everyone I love, been granted such good fortune? 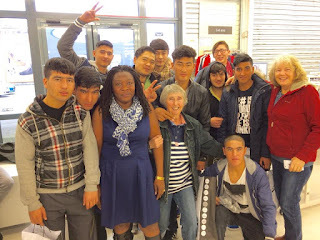 Even as I write, parents of a friend (Sam Jonkers of Henley's Jonkers Rare Books) have been visiting child refugees at a reception centre in Realville, southwest France. Val and Malcolm Johnstone retired to France some years ago and have been hosting older refugees at their home near Toulouse. The kids in the reception centre recently learnt that their asylum applications to join family in the UK had been turned down. It is a case of hopes dashed after months of suffering and hardship. 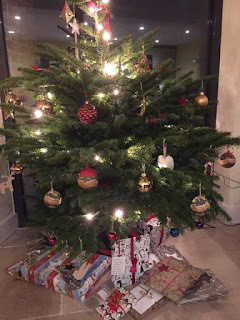 My children still believe in Father Christmas - even the eldest one, aged 12. It amazes me that I have managed to hoodwink them this long, without inadvertently spilling the beans. To be honest, it's killing me. I just want to shout: "HE DOESN'T EXIST!" It's me - my darlings - your dear, old mama, who excels in wish-fulfilment. When to put up the tree? But, of course, I can't. There is magic and excitement to be maintained. If I told them it was Mummy filling their stockings each year, their little eyes would roll over with disappointment and ennui. Instead, I adopt the psychology of a serial adulterer, secretly hoping to be found out one day. I use the same wrapping paper for the stockings fillers as I do for the 'main' presents around the tree, in the hope that they will rumble me. I even leave price labels on sometimes. Last year, Middle Child idly remarked, "Oh look, Father Christmas shops at John Lewis. Isn't that funny?"